Exterior Wall Insulations provide outstanding thermal performance in commercial wall applications to provide continuous insulation (ci) within the building envelope. Both insulations incorporate a proprietary foam technology that use an HCFC-free blowing agent that does not contribute to the depletion of the ozone (non-ODP). Additionally, they offer low global-warming potential (low-GWP) and are formalde hyde-free. 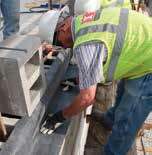 Both rigid insulation panels consist of a specially formulated fire-resistant closed-cell polyisocyanurate foam core laminated to their respective facer options. 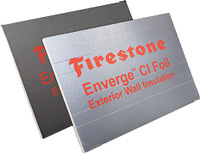 Enverge Air and Vapor Barrier is an asphalt-based, self-sealing wall barrier that provides energy savings and contributes to better air quality for building occupants. Building owners prefer Enverge Air and Vapor Barrier as a sustainable option for their buildings due to the reduced maintenance costs attributed to moisture and thermal control. Engineered and manufactured to create an impermeable barrier, Enverge Air and Vapor Barrier is built to perform for years to come. Enverge FlashGard Thru-Wall Flashing is a tough, resilient EPDM membrane with excellent thermal and dimensional stability. Built on over 100 years of EPDM technology experience from the world’s largest rubber manufacturer, our thru-wall flashing product offers faster installation, superior building performance — and greater confidence for our partners. Together with Enverge FlashGard pre-formed accessories, we can provide the right solution to meet your weather-tight cavity wall needs — and complete your building envelope.